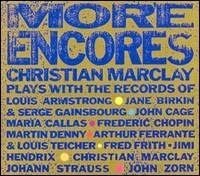 Music for Maniacs: Christian Marclay ‎– "More Encores"
I don't recall hearing the word "turntablism" back in 1989 when this album was released, but that's what this is. Needless to say, this ain't no "wiki-wiki-scratch" type stuff. I saw Marclay in performance with Tom Recchion and Toshio Kajiwara in 2003 and it was quite a sight to see records being so creatively abused, e.g. : 8 'tables all playing copies of the same record, with stickers placed on the vinyl so the records would skip at certain points. I wanna do that! The performance was part of an exhibit of his visual art, which is quite spectacular as well. Witness his giant, useless accordion, or his album cover collages (but what's the middle album in this one, the one in between Michael Jackson and Roxy Music?). 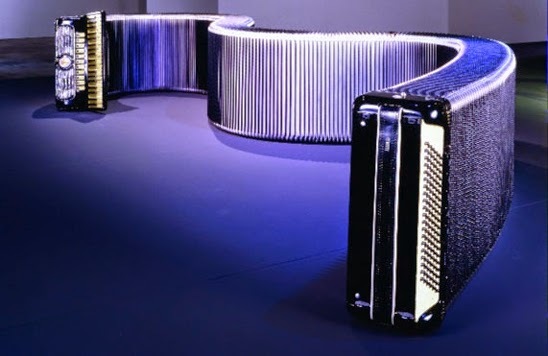 Each piece is composed entirely of records by the artist after whom it is titled. "John Cage" is a recording of a collage made by cutting slices from several records and gluing them back into a single disc. In all other pieces the records were mixed and manipulated on multiple turntables and recorded analog with the use of overdubbing. A hand-crank gramophone was used in "Louis Armstrong". I saw Christain Marclay perform in 1981, at Club Foot in San Francisco as part of a duo. They had a couple turntables and played records they had broken and then glued back together, set records on fire while they were playing, and generally created a storm of noise. On the same bill was Phillip Galas, Diamanda's brother reciting a monologue to a high heeled shoe channelling Jack Smith. Then to round out the evening was solo guitar noise by Henry Kaiser, who I remember remarking about to a friend, "What the hell is he doing setting up $40,00. worth of gear at a dive like Club Foot. Great, thanks DJ - now I can make my own! Great story Tom, had no idea ms Galas even had a performing brother...or was he the one who died of AIDS? He was the one who died of AIDS, who Diamanda has memorialized in her work. I used to see her at small venues in SF a couple years before she released any recordings. I once saw her perform a rock set with Henry Kaiser on guitar, and The Stench brothers who were at the time in Pearl Harbour and the Explosions, an early "new wave" band. Their set sounded a bit like the first Yoko Ono and the Plastic Ono Band album... intense banshee wailing set to driving rock beat.